Stumbled across an interactive flash where Princess Luna from MLPFiM plays around with (stylistically-clashing) giant CG balloons. It’s a cute little toy, even if it’s not all that great. I had fun encountering it. Figured I’d link it. Chances are a number of people who like my stuff might get have a little bit of fun with it too. While she does pop them, there’s no popping noises in the flash (as of writing) though there’s background music which seems to come from a selection of videogames. I at least reconize one tune from Super Mario RPG. There was a shooting outside just a few (+10 by now. Took me some time to write this) minutes ago. Quit out of my Awesomenauts match to lock all the doors and check the family. Here’s to hoping that stuff gets handled and that noone I know was involved. ._. In retrospect: I’m not sure quitting out of my game because OHSHI THEY’RE SHOOTING OUTSIDE was even the best solution, because now I’m going to be punished for my next three matches in game, Aaaaaaand if anyone were trying to get into this house, they’d probably have gotten here before I got to the doors. But eh. Much as I hate to admit it, every day I spend here, I find one more point that makes me farther understand why my mother hates living in this particular house as much as other troubles in her life brought about from the stroke. Just found out that Jetpack for WordPress has an option to cross-post to sources like Tumblr, Twitter, and Google+. So I kinda wanna toy with that a bit. Also, I had a number of people suggest that I’m not as spammy as I assumed I was. So uh. Stuff! 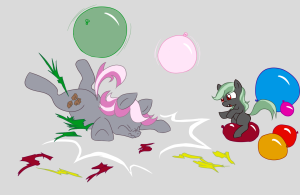 Silver Storm and her daughter Foundation playing with balloons. Silver Storm is too heavy and strong to balance on hers without breaking it, but Foundation has no trouble. Fanart for Fallout Equestria: Heroes. Playing with balloons, which ended up in Marefort due to a merchant making an error during a transaction and having to get rid of them anyway. So now it’s theirs! And then the mother and daughter go and play whatever games they- mostly just Foundation- can come up with! Naturally, almost all of these games involve Foundation winning and Silver losing. But that’s just the way of it. Drawn in Firealpaca on Windows 7 with an ASUS EP121 tablet. I was on the fence as to whether or not to give dialogue to the characters or to draw in sound effects. I’m still not entirely against it, but I’m kinda at my drawing limit for the night, so onto the ponynet the picture goes!